As a realtively recent fifty-something, I am old enough to remember the bad old days of the UK in the late 70s and early 80s, a time of football hooliganism, race riots and bin-collection strikes. The National Front were on the rise and rampant racism, sexism and homophobia were not just tolerated but were prevalent in the national press, mainstream advertising and on prime-time TV. The late 80s saw the introduction of the great political correctness experiment – promoted at the time in London by the GLC who took the position that, by restricting and legislating against the language of prejudice and discrimination, particularly within public organisations such as schools and local authorities, they could create an environment of respect and tolerance towards marginalised and minority groups. It was a much derided and criticized approach and attracted accusations of being superficial and skin-deep. Even now the very term “Political Correctness” remains a pejorative term in the right wing press. However, 30 years on we live in a very different society, and although it is certainly not a perfect one, respect and tolerance of those same minority groups and viewpoints is on the whole far more widespread. The use of the type of derogatory and divisive language and attitudes expressed so openly in the 70s and 80s would be viewed as offensive, abusive and completely unacceptable in public institutions now. Exactly how much of that change can be directly attributed to the introduction of politically correct speak is impossible to say, but there can be little doubt that the use of non-discriminatory, respectful and positive language when talking about specific groups of people can lead, not just to a superficial change of behaviour, but also to a change in the very attitudes and beliefs that underlie that behaviour. And if that is the case for spoken language, surely we should be adopting the same thinking towards the visual language of pictograms and signage and wayfinding icons and symbols? The accessible icon project was started in 2010 by artist, author, design researcher, and professor Sara Hendren and philosophy professor Brian Glenney. Sarah was working on a number of topics focusing on adaptive and assistive technologies, inclusive design, accessible architecture and related ideas, and Brian was involved in social activism and graffiti and street culture. Together they began to question the design of the universally accepted symbol for disability access – commonly known as the wheelchair or handicapped symbol. They saw the symbol as representative of people with disabilities as passive and totally dependent, a mechanical stick figure stuck in helpless immobility waiting for some benevolent, able-bodied person to give them a helping hand. The pair wanted to create a new symbol promoting a more dynamic, positive image of people with disabilities, with movement, action, independence and accessibility at the forefront. The revised icon portrays a person, head forward and arms up, in control of their own movement and navigation, engaged and active. 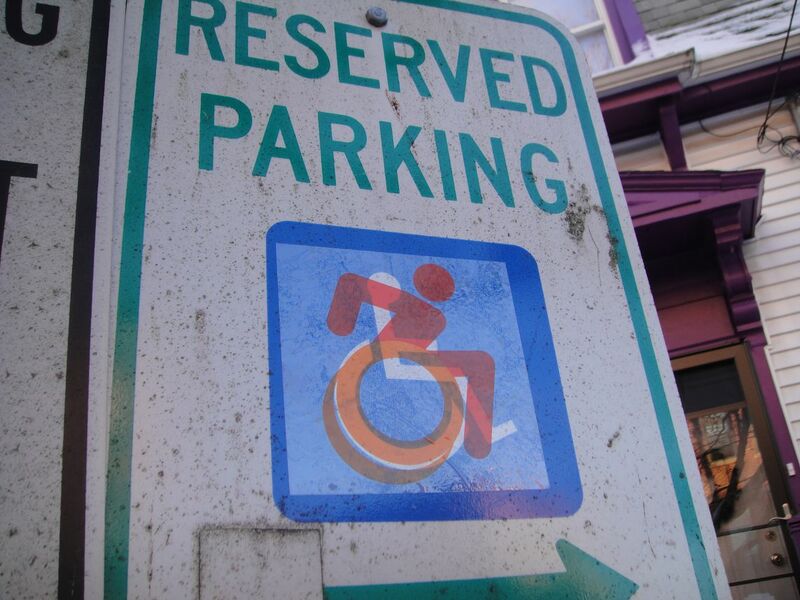 They started a street-art based, direct action campaign in their home town of Boston, graffiti-ing their more dynamic take on the icon in eye-catching orange over existing instances of the disabled access symbol. By late 2011 the project had attracted interest and input from disability rights groups around the world and graphic designer Tim Ferguson Sauder joined Sara and Graham to move it beyond guerilla activism into a social design project. Tim’s contribution raised the overall standard of the design and led to the final version which was released into the public domain, and offered up as an open source icon, free to be appropriated and used by anybody and everybody. Obviously the new design still can’t answer all the weaknesses of the previous one – most notably that not all people with disabilities require a chair, but as a symbol of access which builds on the foundation of an internationally and instantly recognizable icon, it empowers and improves without losing the value of that recongnisability. Since that time the symbol (or variations of it) has been adopted in hundreds of cities and towns around the world, at private and public organizations, used by individual citizens and governments, including New York City, Austin Texas, Nissan’s “Taxi of Tomorrow”, NFL franchise the Jackson Jaguars and the Museum of Modern Art in New York. “This logo is fantastic because it shows that disabled people are not passive/static beings as the classic blue/white symbol suggests. You only have to watch the achievements of the disabled athletes at the World Para Games going on in London this month to see what we are capable of. Not fast enough of course. Perhaps in time the actual word ‘disabled’ will change too to perhaps ‘alt-able’. 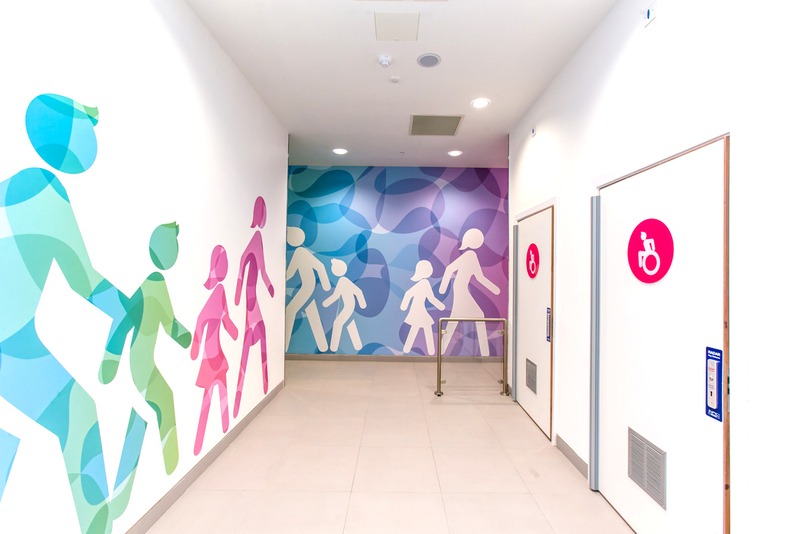 My own opportunity to contribute came in 2015 when we were commissioned to design an environmental graphics scheme for a chain of shopping centres, including their toilet and bathroom facilities. Although it was not part of the initial brief, I presented a redesigned suite of wayfinding icons for the toilets and baby-changing facilities, featuring the new accessible icon. The client (Capital & Regional) were initially slightly cautious about deviating from the universally recognised symbol, but after a few minor tweaks to the design and a bit of time explaining the background to the project I am pleased to say that they accepted the proposed icons and have now applied them across their shopping centre portfolio nationally. As with the politically correct language movement of the 80s there will inevitably be criticism of the new icon as superficial and only skin-deep. Personally, I am sure that it will make a contribution, however subliminal that might be, to a change in the way that people with disabilities are perceived by the wider public, and also in the way that they are treated by public bodies and institutions. Even if it simply prompts discussion and dialogue about disability and accessibility issues it will have played a positive role.